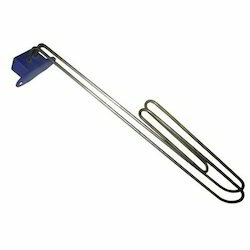 We engaged in providing Alkaline Immersion Heater to our clients. Our expert team allows us to offer an extensive range of Alkaline Immersion Heater, which is perfect for Alkaline Solution to 90 degree and finds its application in chemical tank. These are fabricated using chrome nickel steal tube of of 8.2mm dia to 8.5 mm on the side of vessels. Our range of product is available with a junction a box for terminating the power line. We offer these at affordable prices in the market.